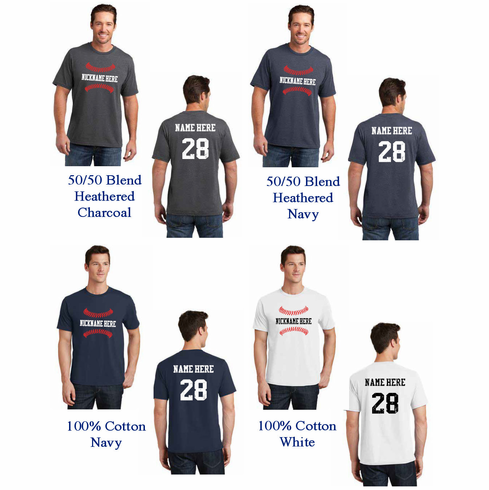 Many of us have baseball nicknames and this custom baseball t-shirt allows you to choose the Baseball Nickname or Team Name you want screened on the chest. You also get to choose the name and number on the back!!! Up to 13 ALL-CAPS block characters and/or spaces can be personalized inside the red baseball stitches on the front. Up to 9 ALL-CAPS block characters and/or spaces and 1 or 2 digit number can be personalized on the back. Distressed graphics, text, and numbers gives this t-shirt design a vintage look. Choose the material (100% cotton or extra soft 50/50 blend) and the t-shirt color. Choose the size (Youth Medium to Adult 4X). *** DOUBLE CHECK ALL TEXT...SELECT THE CORRECT SIZE AND COLOR...ALL SALES ARE FINAL ON THESE CUSTOM TEES!! !